Paruppu Usli is a traditional dish. This protein rich curry is prepared with a blend of lentils, red chilly and vegetable. Usually, usli is prepared with vegetables like beans, snake gourd and carrot.This is a best side dish for rice. Goes very well with sambar sadam and rasam sadam. In few districts of Tamil Nadu people refer Usli as "Puttu". 1. Cook beans with a pinch of salt and keep aside. 2. Soak thoor dhal and red chilly for about 30 minutes.Drain water and grind to coarse consistency with salt and asafoetida. 3. Spread the ground dhal mixture in a oil greased Idly plate and steam cook in idly cooker for about 5 minutes. 4. Cool the steam cooked dhal and then crumble without any lump. 5. Heat oil in a pan. Splutter mustard.Add onion and saute till onion turns golden brown. 6. Add the steam cooked dhal mixture, curry leaves, coconut and cooked beans. Mix the contents well. 7. Medium the flame and cover the pan with lid. Cook for about 10 minutes. 8. Serve with Moor Kuzhambu Sadam and Rasam Sadam. I love paruppu usili.. have one in my drafts too..
Wow........what a beautiful recipe.....Thanks for sharing. Looks tasty and colorful. Yummy! Super tempting usli, can have it simply with curd rice..
awesome parupu usli which is my hot favourite with any veggie. 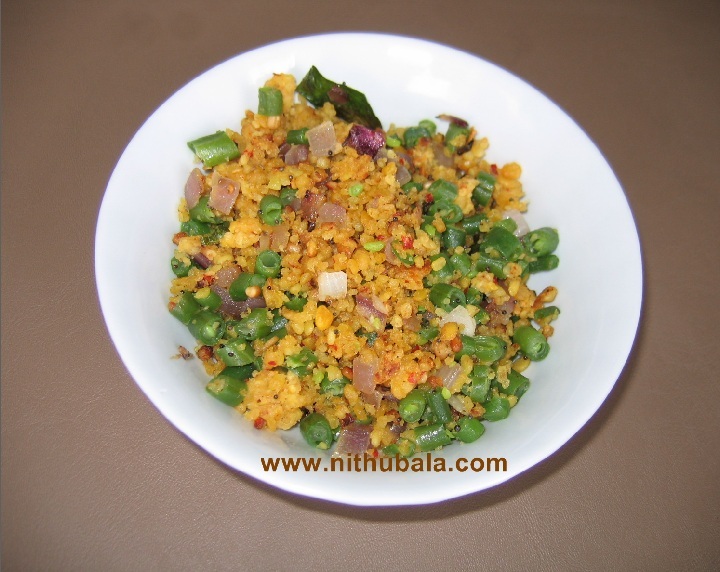 first time to your blog and you have so many recipes to try out.I remember my MIL making this dish as she is from Tamilnadu.Drop in by my space sometimes and hope you'll like it there.Following you for more.